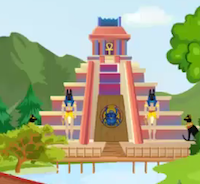 GelBold - GB Pyramid Treasure Html5 Escape is another point and click escape game developed by Gel Bold. You came to know that there are some precious metals lying undiscovered in one of the ancient pyramids in Egypt. Hence, you have set out to find the treasure and escape with it. Finding the treasure is not as easy as you might think because many have failed to get to it before. You need to use your skills and solve some difficult puzzles to overcome the obstacles in finding the treasure. Once you find the treasure, you can escape with it. Good luck and have fun! for the boats puzzle: each row should have a different picture. good game with a few challenges but you need to keep clicking for hotspots, and for the last color code you need to click each color twice before it opened.